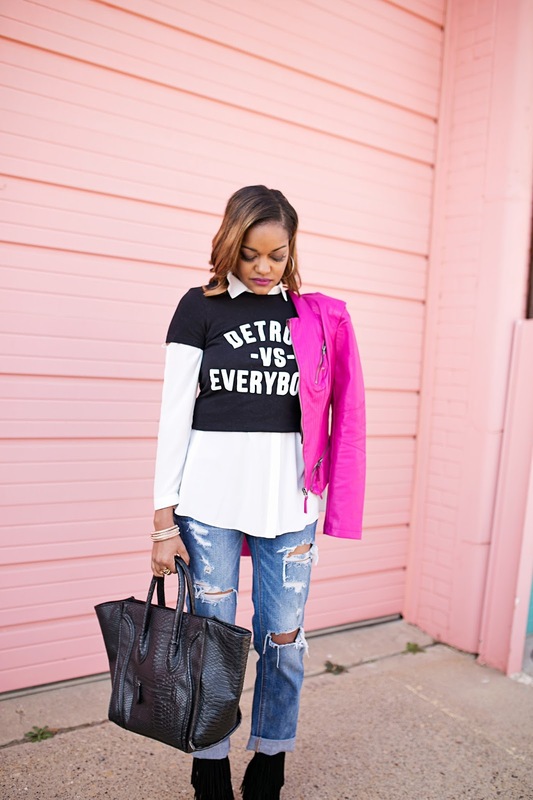 Home Tags Posts tagged with "Look for Less"
How to Style a Graphic Tee- Detroit Vs. Everybody! It’s Thursday! This week has flown by and I am happy about it. I think today’s look is definitely up there as one of my favorites. I absolutely love graphic tees. 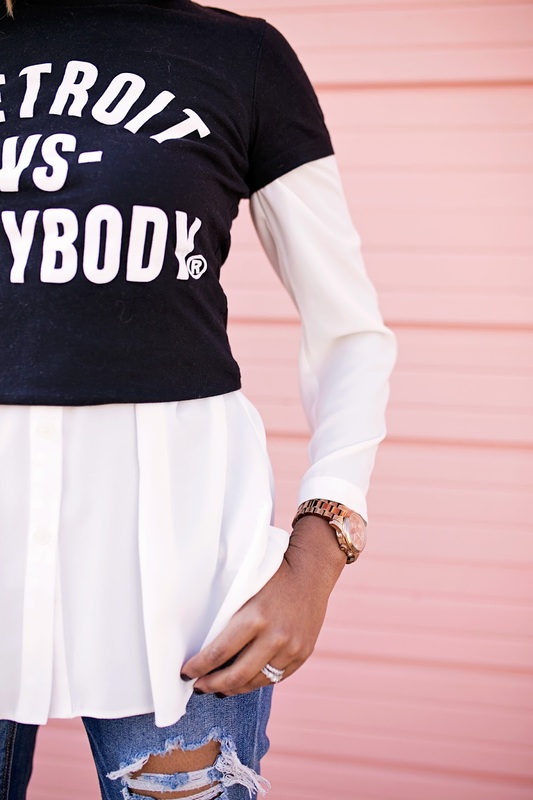 A graphic tee allows you to be creative and expressive.Unsure of how to style a graphic tee? Keep it simple! You can never have too many if you ask me! You can pretty much wear this look anywhere, even for Valentine’s Day if you like. 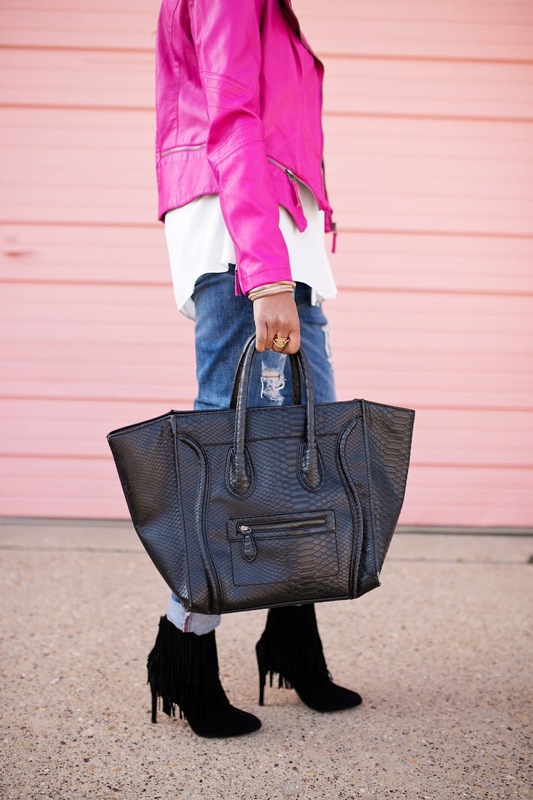 I bought this hot pink leather moto jacket last year and sadly its no longer available in this particular color. I thought it would be fun to add a pop of color to this look and I really feel its the icing on the cake. You guys know I will throw on my favorite boyfriend jeans and fringe boots with just about anything. I think this outfit came together perfectly. Don’t you? 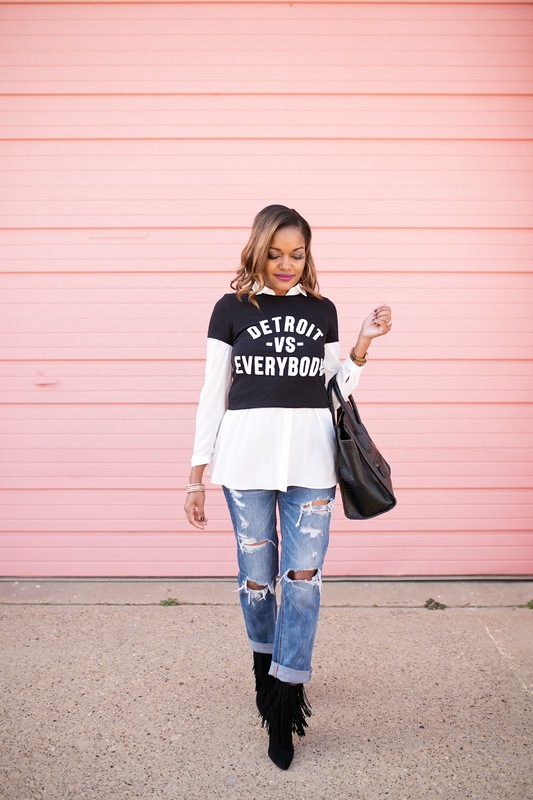 If you didn’t know, I was born and raised in Detroit, Michigan. It is a place that is near and dear to my heart. I know the Detroit you may hear about on the news sounds unsettling. And that it is. But, growing up it was my home. And there is no place like it. 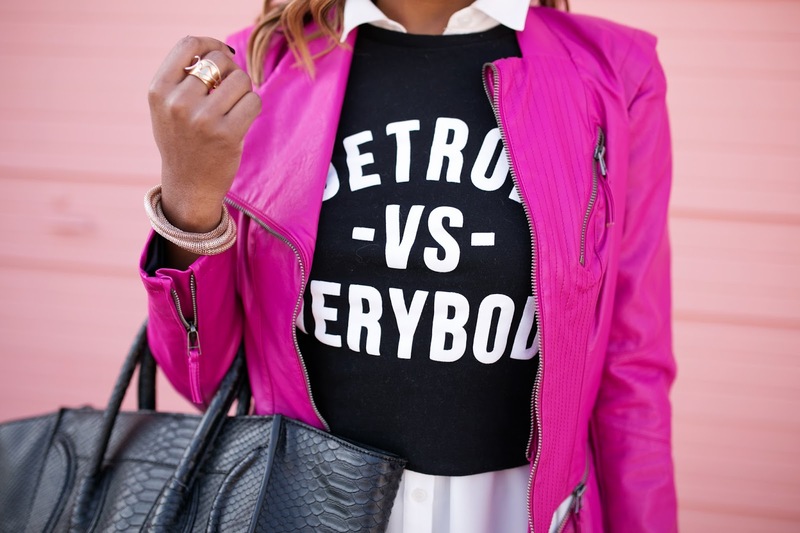 When I tell people I am from Detroit, they are usually surprised. I suppose we all have our thoughts on our expectations of people and where they’re from. I guess because of what they have heard, they expect someone from Detroit would act or behave a certain way. I’m not really offended. But, you most definitely can’t talk down on my city to me!! lol. I always will represent proudly where I am from!! This tee speaks volumes about my city, my home. Most times, it does feel like Detroit vs Everybody. The challenges my city faces are definitely difficult. But, the memories I have growing up in “Tha D” always makes me smile. 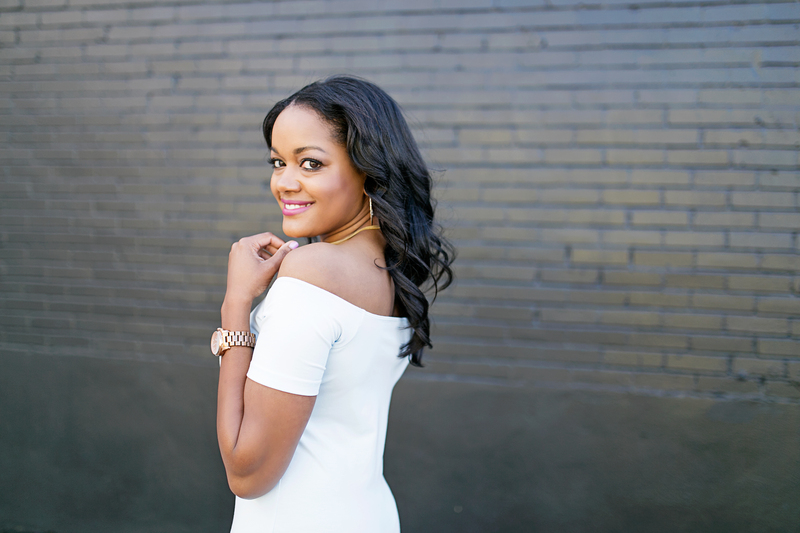 I remember when I was little, playing in the park at Belle Isle across from my grandmother apartment, Easter egg hunts at my church, riding my bike in my neighborhood and getting ice cream at our neighborhood ice cream shop. My high school, Martin Luther King Jr. Sr. is one of the top three high schools in the city. The memories I have of my classmates and teachers are priceless. Cruising downtown with my friends, the summer music festivals at Hart Plaza and eating delicious food in Greektown on a warm summer night. My mom was a community activist and worked hard at rebuilding the neighborhood and serving the community. Everyone knew Mrs. Taylor! She would take me with her to the community meetings and activities. She showed me what its truly is like to give back to your community and to be selfless as well. Looking back, I can appreciate those moments. Her love for the city was truly grand and she loved every second of the work she had done. My mother passed away five years ago. My dad is still there in the home I was raised in. I haven’t visited home since I’ve had my daughter. I’m tearing up a bit writing this post because the memories of home are so vivid and strong. Even though I live in Dallas now, there is truly no place like home. 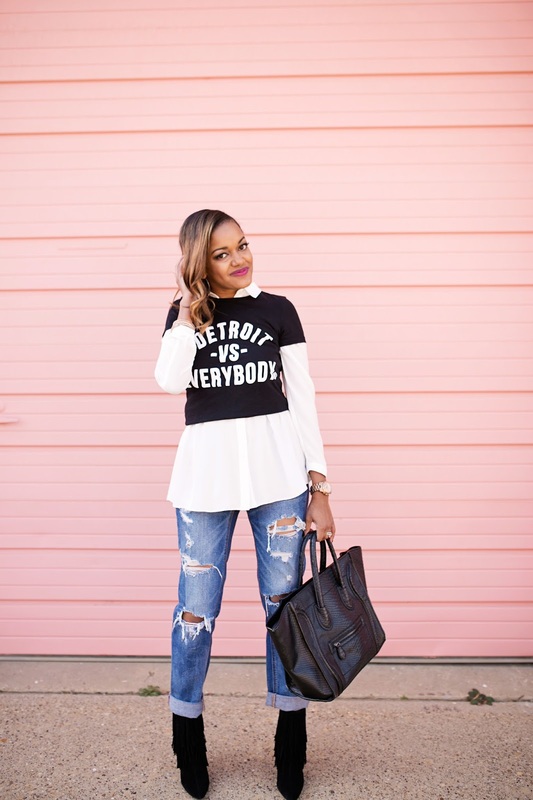 Detroit, I am rooting for you! And I love you. 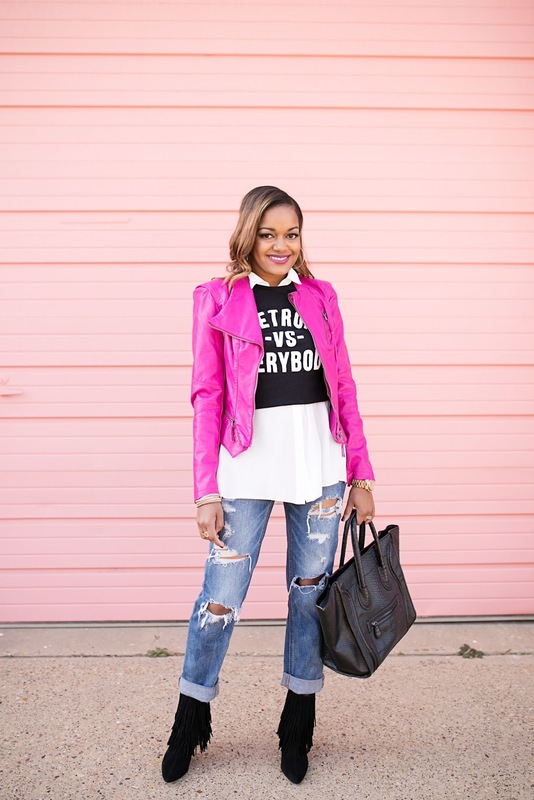 You already know I’ve been in a blush pink sorta mood lately if you seen my previous blog posts (click here and here). It’s such a soft, flirty, subdued color that I am totally into. 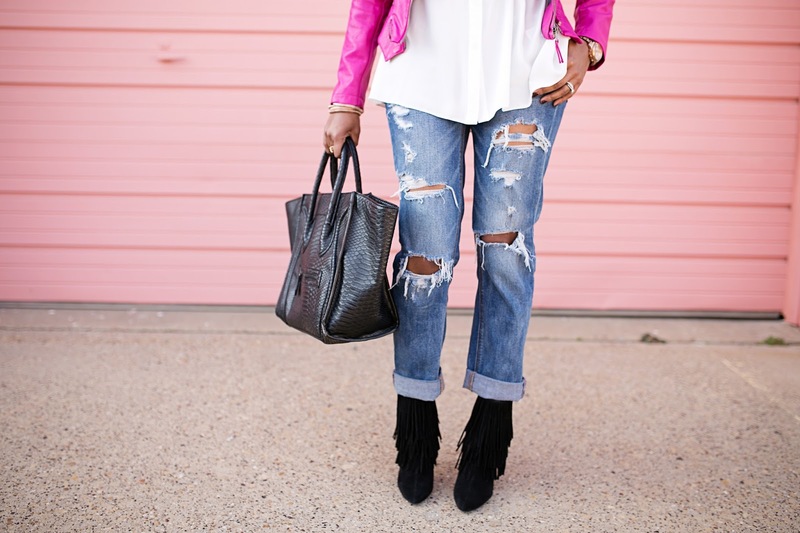 Blush pink paired along with cool gray tones of the moto jeans and fringe booties (worn previously here) offers up serious eye candy! I am really in love with the quilted bag!! 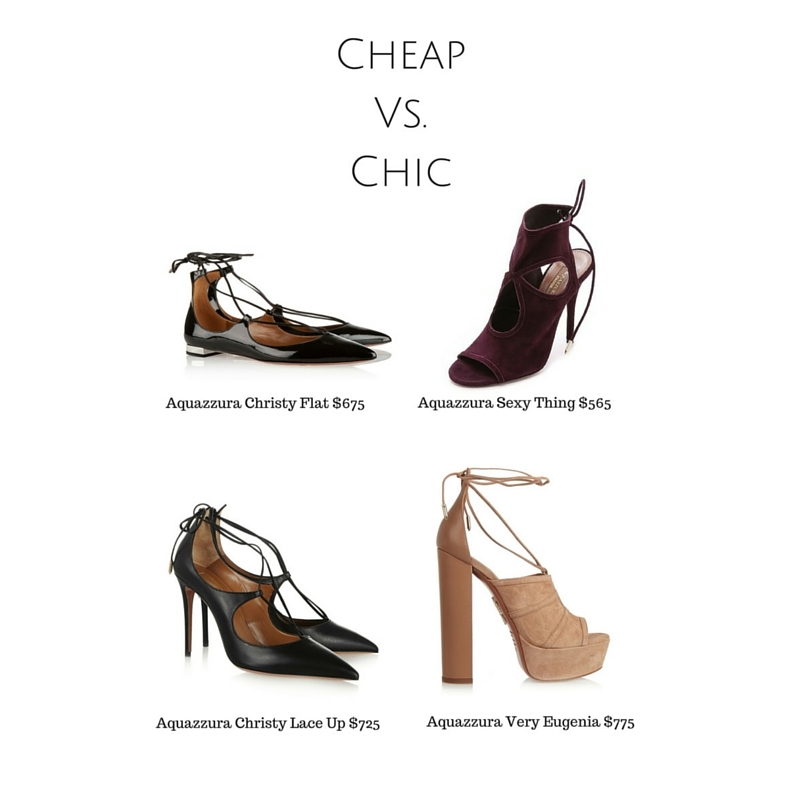 It’s a great Chanel “look for less” option with a wallet friendly price point. Sadly, its sold out at the moment. But, if you stalk the site, hopefully they’ll restock soon. Its such a great piece and I want you to have it!! I’ll also post on my Instagram if I notice that its restocked. I wish you a great week! This Friday is my 34th birthday! I am thankful to God for allowing me to see another year. I can’t wait to share it with friends and my family this upcoming weekend. See you Tuesday for my next post!! Handbag- Forever 21 also love this one and this one in black! also comes in blue, taupe and black! Make Me Brunch -But, no really! I don’t know about where you live, but here in Dallas we are serious about our brunch!!! I absolutely love to eat, that coupled with a yummy mimosa and I am down! When I saw this tee at Kohls I knew I had to have it for my brunch attire. 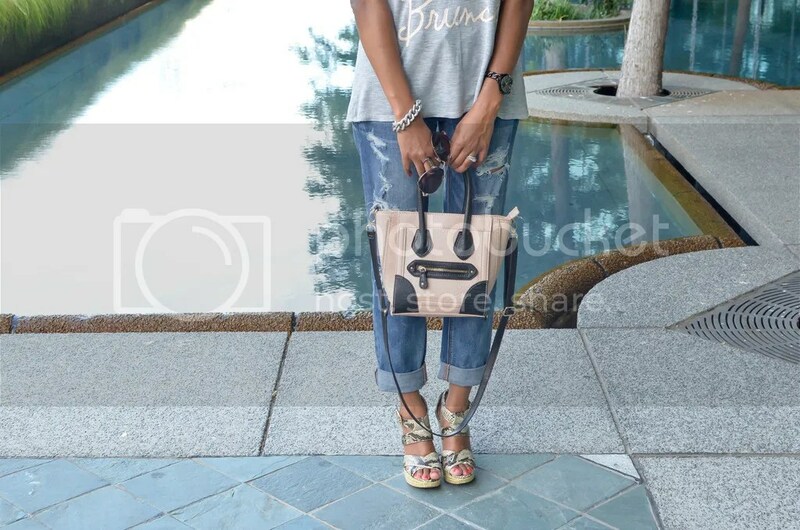 For a casual brunch, I like to keep the look easy but make the look a little special with accessories or shoes. I think this outfit definitely fits the bill. 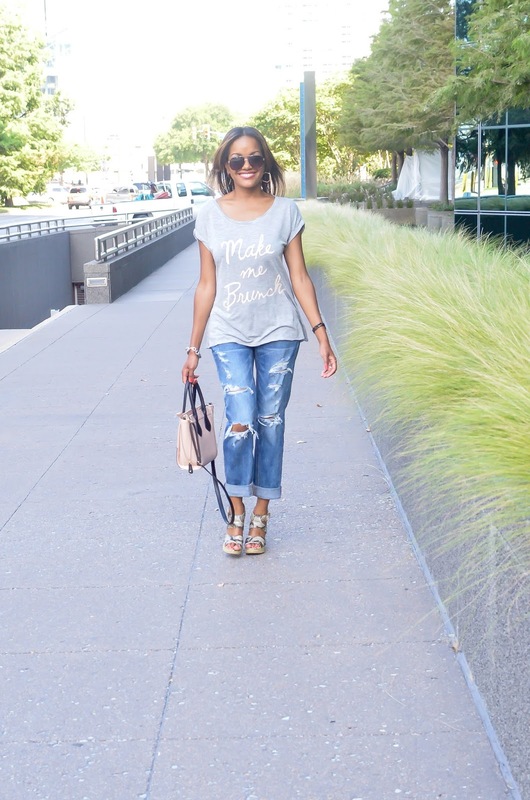 A comfy t-shirt and boyfriend jeans to hide all of the pancake, crepe or french toast goodness that I consume. The cute wedges makes me look like my life is together and that I still got it even as a mommy lol. A few of my favorite brunch spots in Dallas are Breadwinners, Whiskey Cake, Del Frisco Grill and Smoke. Definitely check those places out if you’re ever in my neck of the woods! See you soon for another post!! 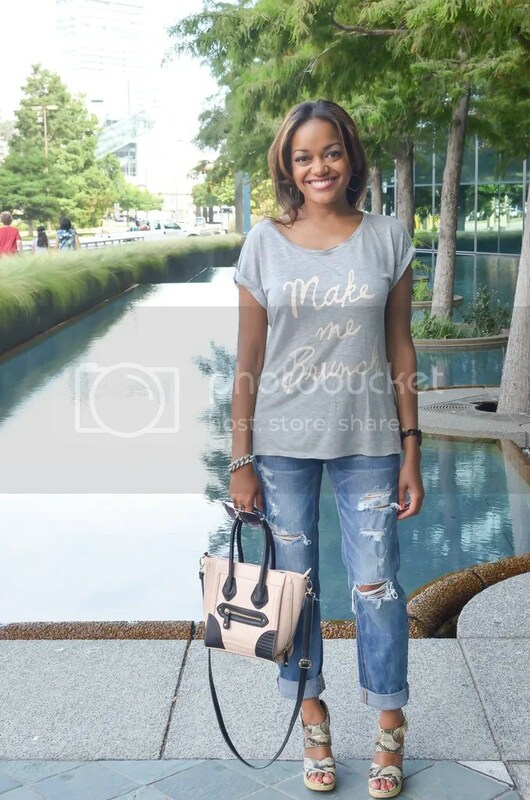 Outfit Details: Brunch T- Shirt- Kohls Jeans- American Eagle and BOGO 50% Off!! 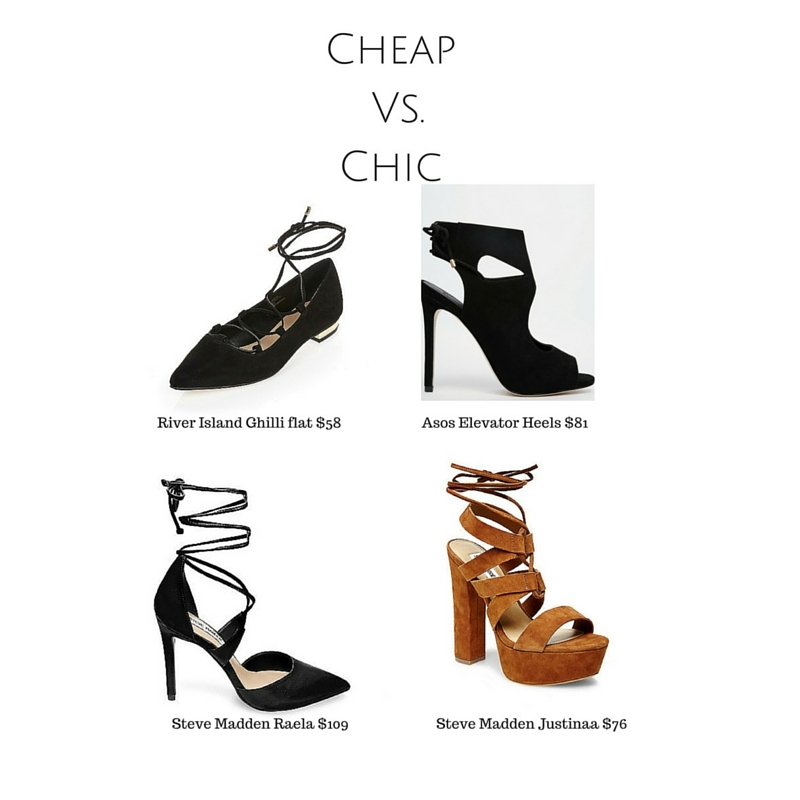 Shoes- Steve Madden (old) but here are some super cute ones I love here, here and these wedges right here tho’? Handbag- Aldo (old) Bracelet- Love Andrea’s Closet Watch- Michael Kors Earrings- Sole Society Sunnies- Aldo’s but craving these Diane Von Furstenburg’s!